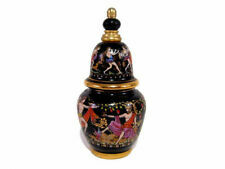 Oleg Cassini Crystal Perfume Bottle, NIB! RARE SEALED WITH PRESENTATION BOX GUERLAIN PARIS. 8.5 FL OZ. BOTTLE IS 6 1/4" TALL. SMALL AMOUNT OF WEAR TO BOX. Over 100,000,000 served. This bottle is near full. CARON PARIS. CONDITION: The bottle and stopper are in very good used condition. The stopper has a plastic cap on his neck. CONDITION: The bottles are in very good pre-owned condition. 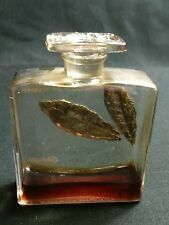 New ListingRare Vintage Bottle Perfume Un Amor en Venecia Crusellas unopened w box venice? 1/2 full, w/box.Bottle is good condition showing a small spot on label and is 1/2 full. Best of Luck! , on bottom label says extract normandie jean patou No 799 paris made in france. THE UNIQUE PIECE MA HAVE BEEN HAND BLOWN, AND IS SIGNED "CZECHOSLOVAKIA" IN THE BOTTOM. New ListingLarge Antique Perfume Bottle Decanter Folk Art Hand Painted Country Scene 7 3/4"
Country Scene. Beautiful Glass Bottle. Hand Painted. 7 3/4" Tall. Purple Glass Dauber. Vintage Parfum Atomizer, Shalimar by Guerlain, Made in France, 8 ml NIB. Shipped with USPS First Class Package. This bottle is about half full. Tabac Blond. CARON PARIS. CONDITION: The bottle and stopper are in very good used condition. The stopper has a plastic cap on his neck. New Listing4-Lalique Bottle group-Worth-Je Reviens-9oz. & 2oz. 4-bottles in this group. 2-9 ounce and 2-2ounce. The glass in in excellent condition but the labels are worn. The 2-9ounce bottles are marked Lalique on the bottom. The top does screw off. I cannot find a picture of this bottle anywhere on the internet. Vintage Lot Of Miniature Brand Name Perfumes!!! This group contains six bottles of Je Reviens by Worth. Two appear to have quite a bit of contents remaining and four are empty. Five are either signed Lalique or R. Lalique. Beautiful SD Simon and Designs. "INDISCRET". LUCIEN LELONG INDISCRET PARFUM 1/2 FL OZ. "ANDRE" PARIS 1/2 FL OZ. CONTENT AS SHOWN ON BOTH. Over 100,000,000 served. 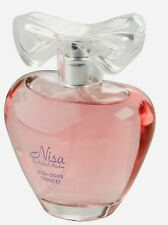 7.5ML MINI PARFUM 1933. "BREATHLESS". CREATED IN 1933. 1/4 FL OZ. FREE scheduling, supersized images. RARE SEALED IN PLEXI GLASS PRINCE MATCHABELLI "CACHET" 1/4 OZ. CREATED IN 1970. Over 100,000,000 served. Darling mini bottles. Set “A” is 20 plus bottles. Condition is Used. P e r f u m e b o t t l e s. It’s t h e b o t t l e c o l l e c t i o n I’m s e l l i n g.
This is not considered a "defect". Buy at your own risk. Middle notes: floral notes. 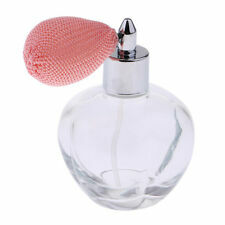 Crystal Bottle w/ Pink Stopper w/ Dauber: bottle has a 1/2" internal crack near the top. Dauber is intact on the stopper. - Red Stopper w/Dauber: Horizontal Scratch across the front; bottom edge of neck is chipped; dauber is intact. JOY BY JEAN PATOU. 8 OZ / 25 ml EDT SP MADE IN FRANCE. WRITING ON BOTTLE IS FADING. Iftotal weight of order exceeds 1 lb, service typemay change to Parcel Select Ground. The fragrance notes have changed due to its age . 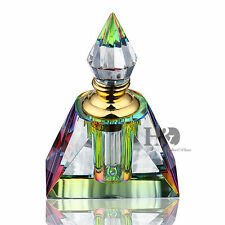 New ListingLarge Vintage Czech Hand Cut Polished Crystal Perfume Bottle Bohemia Dauber 7"
Bohemia Glass Dauber. Beautiful Crystal Bottle. Hand Cut Polished Crystal. 7" Tall x 3 3/4 " Wide.